DO YOU LOVE THE GREAT LAKES? AFTER SAILING across the atlantic to research plastic pollution in our waters WE LEARNED THAT thIS issue are not just 'out there' IN THE OCEAN but right here in our backyard. we realised all the solutions start on land, in our homes & communities. we decided to organise the world's largest simultaneous sampling for microplastics in history to raise awareness & instigate action for a healthier future - for us, for the great lakes, and for the wider world. in august 2016, over 1,000 people took to the lakes and connecting waterways by foot, paddleboard, canoe, kayak & sail to stand up for the health and future of our waters. THIS movement & COMMUNITY grEW IN 2017 AND WE WANT TO ENCOURAGE THIS through an annual love your greats day ON THE SECOND SATURDAY OF Every august - this year is the 11th august. 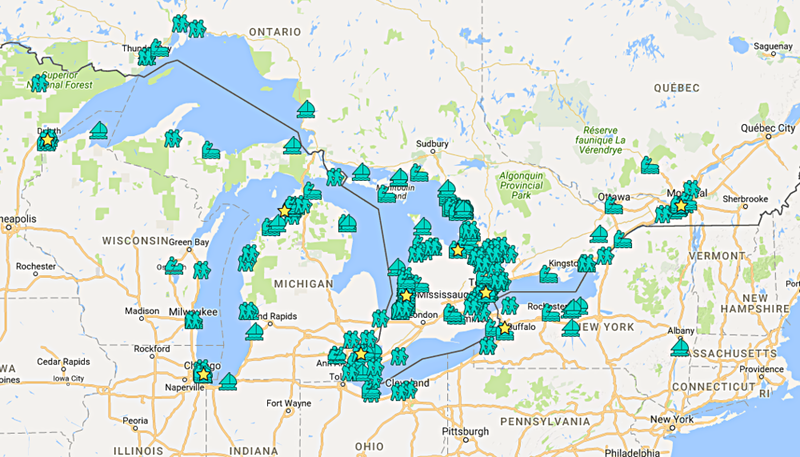 THERE ARE SO MANY initiatives, businesses & organisations around the great lakes - in the USA & CANADA - THAT CAN HELP YOU GET OUTDOORS, EXPLORING & EXPERIENCING THE LAKES, WHILE KEEPING THEM CLEAN & SAFE FOR THE FUTURE. START SEARCHING AND CHANGE YOUR SUNBATHING INTO CHANGE MAKING! FOLLOW US ON FACEBOOK, TWITTER & INSTAGRAM FOR ANNOUNCEMENTS AND FILL IN THE FORM BELOW TO LET US KNOW WHAT YOU'RE PLANNING FOR THE DAY. WE ONLY NEED YOUR FIRST NAME OR THE FIRST NAMES OF OTHER PEOPLE TAKING PART WITH YOU. MAYBE YOU'VE GOT AN AWESOME GROUP NAME (LIKE 'THE FRESHWATER FISH'...OK MAYBE IT'S BETTER THAN THAT) LET US KNOW THE NAME AND THE PEOPLE TAKING PART! Let us know where you are taking part! It's really helpful if you can include specifics so we can add you to our love your greats day 2017 map. Whatever you are planning to do on the day, let us know! whether you are taking a sample for microplastics, doing a bioblitz to record wildlife or maybe you're just going for a walk on your local shoreline - we want to hear from you!